When it comes to having a pet, they not only provide us with companionship by making us feel secure, accepted and happy, they act as an anchor or stable force that helps one cope with the stresses of everyday life. Their unconditional love gives our mental and physical health a boost, and for this reason there is much to be said about the responses humans have had to pet therapy as an alternative or supplementary treatment to help reduce stress, as well as treat a whole range of medical and emotional ailments. Dogs, cats, dolphins, and many other types of social animals have been used for years for this type of therapy, with encouraging, positive results. But what about using a fish aquarium in this way? Does aquarium pet therapy have any beneficial health merits? 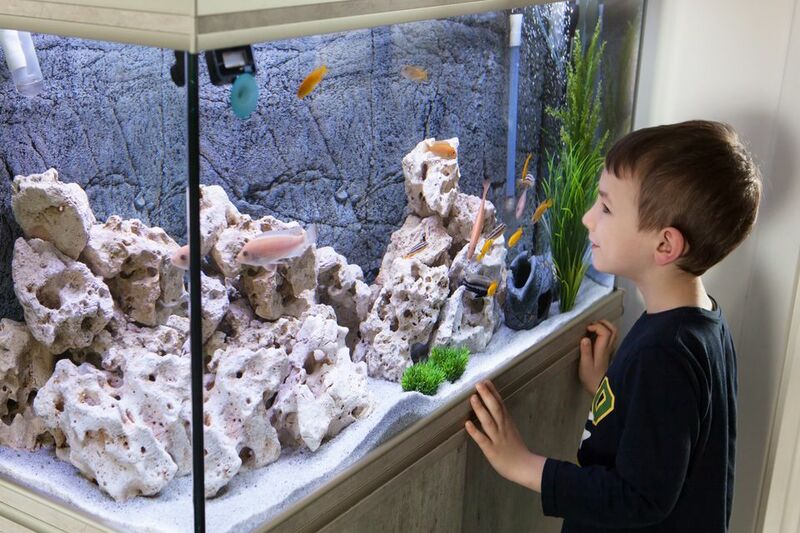 People visit public places every day, and it seems more and more often that aquarium display tanks are being seen. We are hypnotized by their peaceful and serene nature, creating a calming effect for a few moments in our hectic lives. For example, have you ever been sitting impatiently and anxiously in a doctors' overcrowded office or a hospital emergency room waiting area that has had an aquarium in it? You stared into this wonderful miniature water world before your eyes and seemed less agitated and anxious. You may have felt more willing to temporarily accept that things are just the way they are, rather than get more upset or worried. From your own experiences, no matter where the location of an aquarium you may have been seen was, did you feel this same type of stress reducing response? It's no wonder. Researchers are finding that fish aquariums, whether salt or freshwater, do have therapeutic health benefits. There is much being done around the world to research the therapeutic benefits of aquariums, as the following reports reflect. At Purdue University, researchers have found that displaying tanks of brightly colored fish may curtail disruptive behaviors and improve eating habits of people with Alzheimer's disease. A Purdue News August 1999 Report states that, "Nursing Professor Nancy Edwards" tracked 60 individuals who resided in specialized units in three Indiana nursing homes. She found that patients who were exposed to the fish tanks appeared to be more relaxed and alert, and they ate up to 21 percent more food than they had before the introduction of the fish tanks. The average increase in food consumption was 17.2 percent." In the August 1997 issue (no longer archived online) of the Monitor on Psychology, a publication of the American Psychological Association, Rebecca A. Clay wrote about how "Psychologists Find Animals To Be A Helpful Adjunct To Therapy". Rebecca discussed Dr. Aubrey Fine's pet therapy approach. In Fine's practice a golden retriever named Puppy typically greets patients, while several fish tanks help soothe agitated feelings. Rebecca stated that, "Fine also uses the animals metaphorically. The birds, for example, can prompt discussions of flight, freedom or clipped wings. Often the animals become symbols of the children themselves, especially when the patients have attention deficit/hyperactivity disorder (ADHD). A particularly playful cockatoo, for example, gives Fine an opportunity to point out ADHD-like behaviors such as impulsiveness and an inability to sustain attention in a non threatening way. And a particularly active inhabitant of one of Fine's three fish tanks caused one patient to blurt out, "That fish reminds me of me!" From Holistic-Online.com, their Pet Therapy page outlines the benefits research have found in relation to pet ownership. They say that, "Research has shown that heart attack victims who have pets live longer. Even watching a tank full of tropical fish may lower blood pressure, at least temporarily." You can draw your own conclusions as to the health benefits of using fish aquariums for therapy as we have, but here are some other resources that further confirm that many researchers are finding that there IS something to it! For those of us that keep and maintain a saltwater aquarium, we expose ourselves to the stress relieving benefits it has to offer on a daily basis. However, on the other side of the coin as an aquarium keeper, you have to consider possible stress inducing factors as well. An experienced aquarist is adept at handling aquarium problems that may arise, but when first getting started there is much to learn. You worry about getting it all set up, selecting the right filtration system and tank inhabitants, cycling the tank, hope that the fish don't get sick, and, and, and... See what we mean? It's easy to reap the stress reducing benefits of an aquarium when someone else is taking care of it and all you have to do is enjoy it. Yes, there are going to be times when an aquarium will cause some stress in your life rather than reduce it, but in our opinion it is well worth it! Once you get past the initial stages of getting started and become skilled in the art of aquarium keeping, the good benefits far out weigh the bad that you may encounter over time. If you personally feel that keeping a saltwater aquarium would be too stressful for you, there is a simple solution. Have an experienced aquarium maintenance company or person put one together for you and maintain it! There are many aquarists out there that literally thrive on and live for saltwater aquarium keeping. Why not avoid needless stress and worry by letting someone do it for you, and in turn reap the stress reducing health benefits yourself. Did you know that aside from public display fish aquariums being good for your health, they can be applied in educational ways as well?